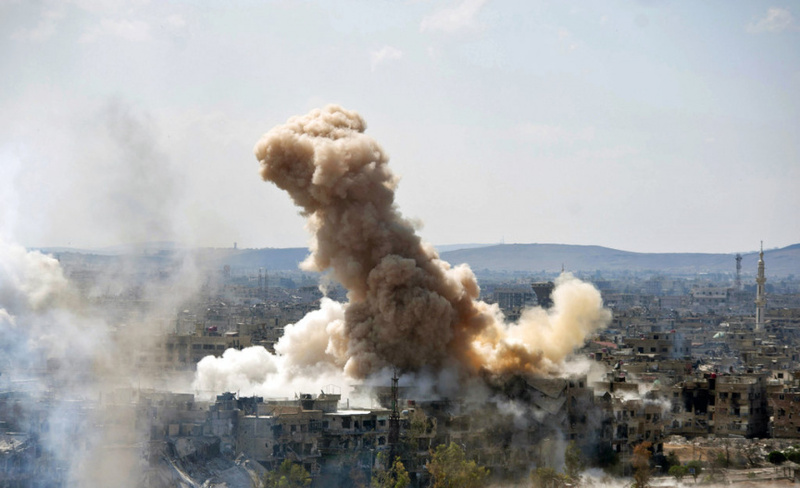 BEIRUT (AP) — Syrian government forces used warplanes, helicopters and artillery on Sunday to pound districts of the capital held by the Islamic State group, in a bid to enforce an evacuation deal reached with the militants earlier in the week. The militants agreed to give up their last pocket in southern Damascus on Friday but have yet to begin surrendering to government forces and relocating to IS-held areas elsewhere in the country. State-run al-Ikhbariya TV showed thick gray smoke billowing from the IS-held Hajar al-Aswad neighborhood on Sunday, and government warplanes streaking overhead amid heavy bombardment of the area. Hundreds of IS fighters and allied militants are holed up in Hajar al-Aswad and the nearby Yarmouk Palestinian refugee camp. President Bashar Assad has escalated his military campaign to retake all remaining enclaves in the capital and surrounding areas. The IS-held areas in southern Damascus are the last holdouts, after rebels evacuated the eastern Ghouta suburbs following a fierce government offensive and an alleged poison gas attack in the town of Douma. The site visit, confirmed by the Organization for the Prohibition of Chemical Weapons, will allow the agency to proceed with an independent investigation to determine what chemicals, if any, were used in the April 7 attack that medical workers said killed more than 40 people. The OPCW mission is not mandated to apportion blame for the attack. On Sunday, Sweden's Ambassador to the United Nations said that he and other Security Council envoys had agreed to work on a "meaningful mechanism" to work out who was behind the alleged use of chemical weapons in Syria. Olof Skoog spoke in southern Sweden after an annual, informal working meeting with the U.N. Security Council ambassadors. The meeting comes just a week after the U.S., France and Britain bombed suspected Syrian chemical weapons facilities, after accusing Assad's government of being behind the attack in Douma. Associated Press writers Albert Aji in Damascus, Syria and Jari Tanner in Helsinki, Finland, contributed reporting.